This update brings watch-based texting support to iOS, as well as multiple improvements to Pebble Health on both Android and iOS. Although Pebble has been forced to lay off a significant part of its workforce, the company continues to deliver firmware updates for its existing products. Version 3.12 of the Pebble software comes just in time for this summer, providing enhanced fitness tracking and much more. According to the official blog about this update, Pebble has "taken Pebble Health beyond daily step and sleep tracking." 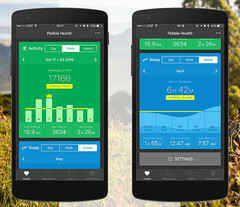 The app now allows its users to view activity trends over time, sleep smarter, auto-track long walks and runs, as well as to "enforce healthy habits with insights and encouragement." Pebble Health integrates now with the Pebble mobile apps for both Android and iOS while the two text message features that were only available on Android so far also reach iPhone users. In addition to the above, the new Pebble firmware also offers Smart Alarms, various bug fixes and performance improvements. More details on the improved activity monitoring and tracking features can be found in the video below.